Coconut oil is highly beneficial for health as it boosts your energy and endurance. Besides, it stimulates the metabolism, controls cravings, aids in digestion, facilitates nutrient absorption, and improves thyroid function. Furthermore, it protects against heart disease, controls diabetes, and promotes weight loss. Hence, you can consume about three to four tablespoons of coconut oil per day. When consuming or using coconut oil for other purposes, it is best to opt for extra virgin coconut oil. Here are some fabulous ways to use coconut oil. It can be used as a toast spread. You may look for recipes for delicious yet healthy toast spreads that you can create using coconut oil. Besides, you can replace butter with coconut oil while baking brownies, cookies, muffins, etc. It also makes a healthy substitute for vegetable oil used for cooking. You may add a little coconut oil (molten) in your smoothies, too. Coconut oil works as a fabulous eye makeup remover. For this, you just need to dab a little coconut oil on a cotton scab and use it to remove your makeup. In addition, you can use it to clean your mascara brush. Application of coconut oil helps in getting rid of lice infestation. For this, you need to massage your hair and scalp with organic coconut oil and then, comb through the hair with a lice comb at least twice. Next, shampoo your hair. After drying your hair, again apply coconut oil liberally and leave overnight. Comb your hair in the morning. Finally, shampoo and condition your hair. You can even feed organic coconut oil to your pet as it can improve your pet’s skin and hair coat. Plus, it controls fleas and fights fungal infections because it contains caprylic acid. Moreover, it relieves arthritis, and works as a natural internal deodorizer, thereby eliminating bad breath in dogs. Thus, you can add a teaspoon of coconut oil in your pet’s food or water. You may also use coconut oil for preparing a variety of homemade products such as homemade soap, deodorant, insect repellent, lip balm, body scrub, and even toothpaste. It can be used as an after shave to relieve razor burn and heal the skin. You can use it as a pre shave as well. Coconut oil can be used as a sunscreen, especially for those with dark skin. It has an SPF of about 4 to 6. It is excellent for managing frizzy and flyaway hair. Interestingly, coconut oil works as a leather moisturizer. Hence, you can put a small amount of coconut oil on a clean cloth and work it into your leather shoes to moisturize and increase their shine. You can rub a little coconut oil on the inside of your nostrils to prevent nosebleed due to dry, cracked skin on the inside of your nose. Expectant mothers can regularly apply coconut oil on the abdominal area (from the seventh or eight month of pregnancy) to prevent and reduce stretch marks. The oil is great for newborns as well, because it works as a natural diaper cream that moisturizes the baby’s soft skin and fights bacteria. 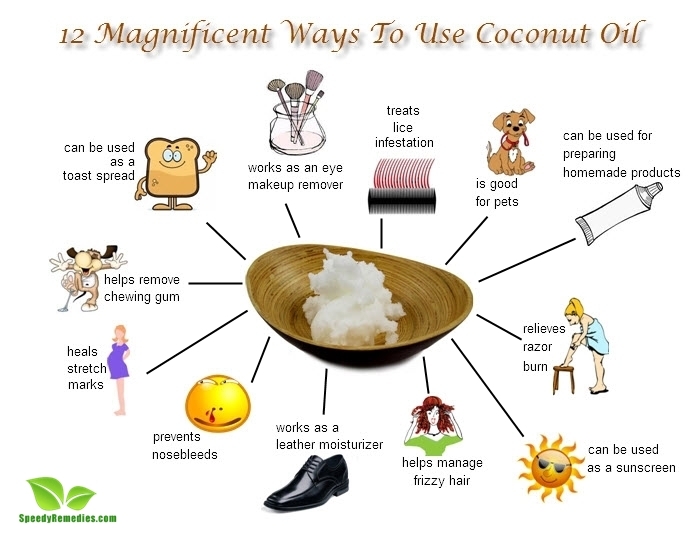 Coconut oil can be used to remove chewing gum from hair, clothes, shoes, etc. You can leave it on the sticky area for about 30 minutes so that it becomes easier to remove the gum.